Click here for quarterly Peace & Justice Newsletter. at the Train Station at Main Street Landing. Be part of the best dance party of the year. Money goes to support VT Access to Reproductive Freedom. Cosponsored by the PJC. Suggested donation is $15-$150. at Fletcher Free Library, Fletcher Room, Burlington. In recognition of Human Rights Day, members of the Women’s International League for Peace and Freedom (WILPF) lead a workshop for children (age 7-13). They’ll share a children’s book, watch a video, sing songs, and create a human rights quilt out of paper squares. Parents welcome to join in. Sponsored by the Burlington VT Chapter of WILPF. Saturday, January 26, 2-3 pm at PJC. Explore the differences between Fair Trade Certifications, Fair Trade Membership Organizations, and Direct Trade to help us better understand the Fair Trade Movement. For more info on these events visit Upcoming Events or contact program@pjcvt.org. visiting our website and applying by November 29! The American Civil Liberties Union of Vermont seeks a highly motivated, organized, and skilled professional with demonstrated communications experience to join their team.Visit their website to learn more. Help support Burlington’s homeless population by making a donation to I AM SOMEBODY- Winter Blessings. There is one warming shelter in the Burlington area, but during the day people have to leave and have nowhere to go until 6pm. The donations raised will provide them with regular coats, raincoats, socks, undershirts, blankets, long johns, hats, gloves, jeans, undergarments, hot food, hot coffee, hot tea, and hot chocolate, and more. Want to see more of the Peace & Justice Center more often? Follow us on social media to see pictures, read articles, and be in the know about what we are up to, community issues, events, and more. Hours are subject to change. Call (802) 863-2345 x2 to confirm. 10th Annual Shake Off Dance Party! Support reproductive rights and economic justice by attending the 10th Annual Shake Off on December 1, 6pm at Union Station, 1 Main Street, Burlington. 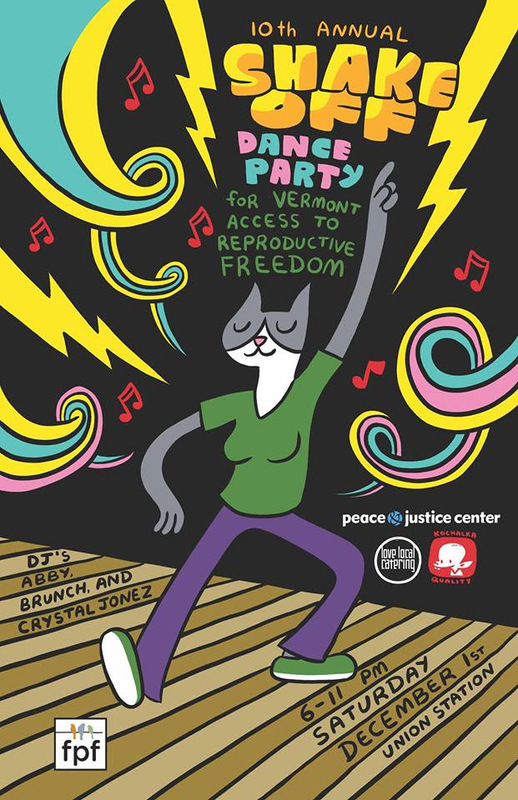 This annual dance party raises funds for Vermont Access to Reproductive Freedom and is a mainstay of their abortion fund. Suggested donation is $15-$150. Find More Information here. 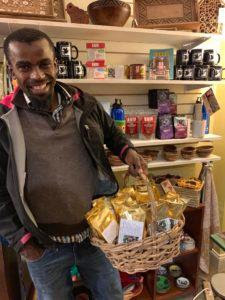 Pierrevy Polyte is an artist, coffee farmer, and founder of a worker cooperative that now has more than 800 members. Pierrevy is from Haiti and has been living in Burlington, Vermont since 2016. 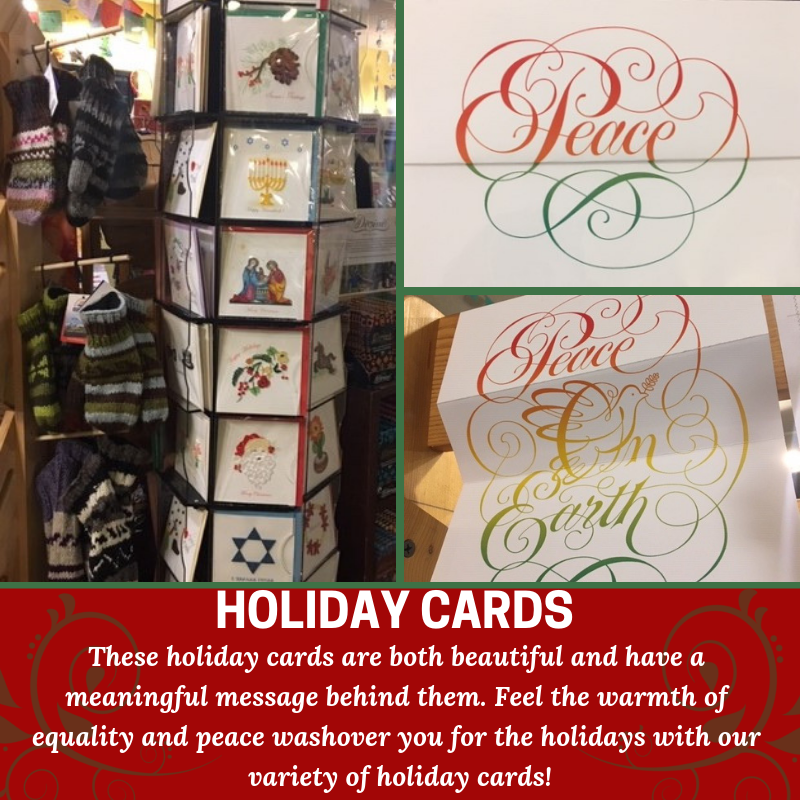 He is one of the Peace & Justice Centers more recent vendors, selling coffee and mixed media art as a result of a direct trade partnership. I recently had the pleasure of sitting down with Pierrevy for an interview. I wanted to not only to learn more about his products, but to know more about the inspiration behind all he does. To begin to understand how Pierrevy got to where he is today, one must first understand his homeland of Peak Macaya, Haiti. Peak Macaya is the second tallest mountain region in Haiti, and home to the country’s last area of cloud forest- characterized as a tropical and moist climate at high altitudes. This region is rich with biodiversity and extremely delicate in the shaky hands of climate change. In fact, Pierrevy and his community are still repairing from the devastation of Hurricane Matthew in 2016. Children’s Workshop on Human Rights Day December 15, 10-12pm, Fletcher Room. This is a partial listing. See more in our public calendar. 6-8pm RAD Organizing Team Meeting. 423 Main St, Bennington. 6:30-8:30pm Coalition for a Livable City. PJC, Burlington. 6:30-8:30pm Film Screening of Angst: Raising Awareness Around Anxiety. Davis Center, UVM, Burlington. 10am-12pm Caroline Fund Pro Se Legal Clinic. Lawline of Vermont, 274 N Winooski Ave, Burlington. Every Saturday. 6-6:30pm JUMP’s 30th Anniversary Celebration Dinner. Elks Lodge, 925 North Ave, Burlington. 5:30-8pm Youth for Change. Root Social Justice Center, Brattleboro. 6-8pm 350VT meeting. 179 S. Winooski Ave, #201, Burlington. 6-8pm Save Our Skies. PJC, Burlington. 6-8pm Families United. Root Social Justice Center, Brattleboro. 6-8pm BLM White Caucus for Collective Liberation. PJC, Burlington. 2-5:30pm Soul Food Sundays. POC Gathering. Root Social Justice Center, Brattleboro. 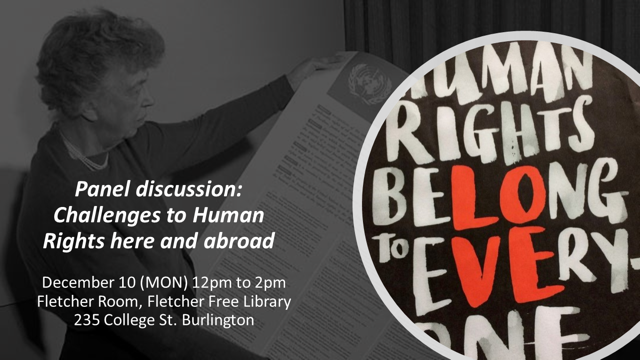 12-2pm WILPF Human Rights Day Programming. Fletcher Free Library, Burlington. 6-7:30pm VTJP meeting. PJC, Burlington. 7-8:30pm 350VT mtg. 179 S. Winooski Ave, #201, Burlington. 6-8:30pm PJC board mtg at PJC. 7-8:30pm 350VT meeting. 115 Hillside St, Bennington. 5:30-7pm WILPF meeting. PJC, Burlington. 3. 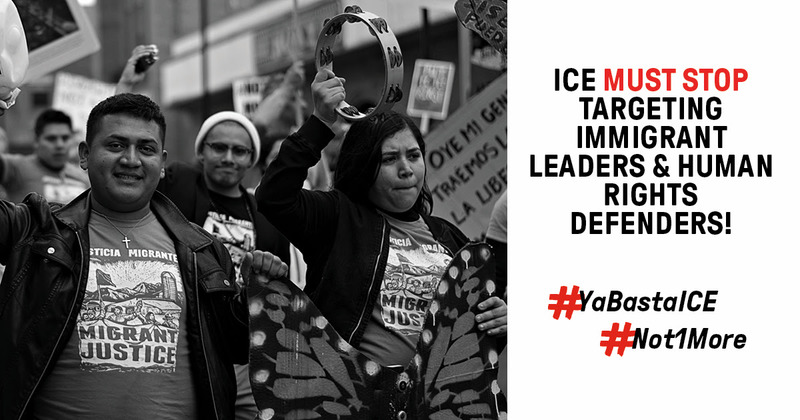 Learn about the New Sanctuary Coalition and support their Sanctuary Caravan to accompany migrants and asylum seekers at the border and at ICE hearings. 4. Sign this petition from Win Without War asking Sec. Mattis to reject the illegal use-of-force order, and bring the troops home now! 5. Donate air miles. Lawyer Moms of America has been contributing airline miles and money to people in shelters along the border. This entry was posted in Equity & Social Justice, Events in the Broader Community, Jobs & Internships on November 30, 2018 by S.C. Intern.